We’re about six years away from the opening of the Purple Line subway extension to both Fairfax and La Cienega. Even though that’s a long time, it’s not too early to start planning for its arrival, especially when it comes to walkability. Metro and the cities of Los Angeles and Beverly Hills can learn a few lessons from the Expo Line, which opened to Culver City in 2012 and Santa Monica four years later. Metro and the city of L.A. did almost nothing to increase walkability around its stations, especially since nearly all the light rail stops bump up against massive, multi-lane boulevards. The transit agency and the city have yet to add curb extensions to shorten pedestrian crossings or even give longer walk signals to cross the wide streets; heck, the Sepulveda station only got a west-facing sidewalk a few weeks before the extension opened. Santa Monica, on the other hand, planned years in advance for the train. Right around the time of the extension’s opening, a huge pedestrian esplanade opened at Fourth and Colorado; the city also added scramble crosswalks to separate cars from people. Helpful street signs indicate the walking distance/time to destinations like the pier and 3rd Street Promenade. The Breeze bike share is easily accessible from all of Santa Monica’s train stations. That’s certainly not the case with L.A.’s stations. The Purple Line’s Fairfax and La Cienega stations will need the most help, since many riders will attempt the half-mile walk to destinations like the Grove, Farmer’s Market, Beverly Center, and Cedars-Sinai. A walk to any of these places from the subway should take between 10 and 15 minutes; shorter than hailing a Lyft and sitting in traffic. But will the walking experience be like? If it’s unpleasant, will people say, “Screw it, I’m driving next time”? Narrow sidewalks line both boulevards—massive trees on Fairfax complicate widening, but there’s time to move and replant them somewhere else. The crosswalks are also faded and should be painted in bright colors to ensure drivers give pedestrians safe distance. Something needs to be done about the chaotic Whole Foods exit, where cars spill out onto Fairfax; it’s already hostile to pedestrians, if not downright dangerous. The walk along La Cienega is slightly more pleasant than Fairfax—until you get to the cluster-mess where Burton, Fourth, San Vicente, and La Cienega converge. There the lights are too short for people to cross without panic. Major curb extensions are needed to shorten the walks, and traffic lights need to prioritize people over cars. Aside from the safety concerns, which should be the utmost concern, Metro, L.A., and (to a lesser extent) Beverly Hills need to pay attention to aesthetics. 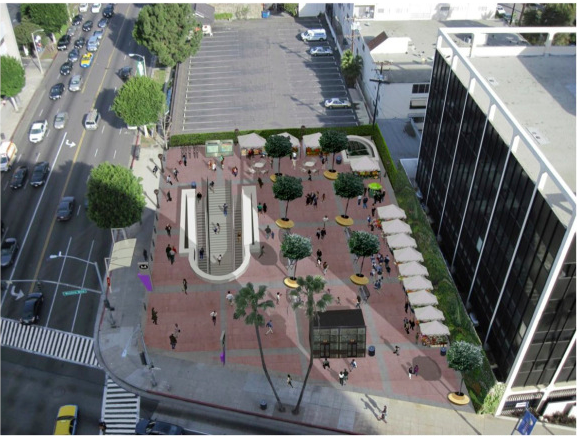 Some landscaping would help erase the sea-of-asphalt look that prevails south of the Beverly Center. Meanwhile, shade trees should cover the sidewalks so pedestrians aren’t burned alive walking to the mall or hospital. Finally, there’s no shortage of blank walls on the walk from the subway. Metro has a significant art budget; it could enliven the pedestrian experience from its stations.